Karyn Gerrard: What's Going on in My Writing World? What's Going on in My Writing World? A lot! Right now I am working on galley edits for THE WICKED BAD (coming April 15th, Crimson Romance), I have to get it back in a couple of days so that has pushed other things on the back burner. Guy above looks like Nick, my hero in The Wicked Bad. Want to mention my hero is not part of a biker gang, just loves to ride. 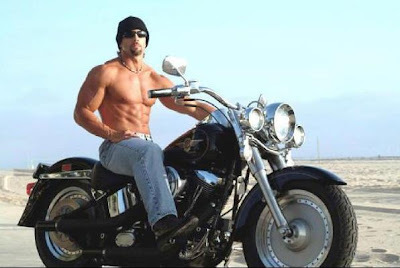 Also on the bad-boy-biker theme, I am catching up on Sons of Anarchy. Just about to start season 5. Very addictive and entertaining. I recommend! Another show I recommend? History channel's Vikings. Love it. Any news on my three Decadent releases? The short answer is no. It's been seven months since I sighed the contract for MY HIGHLANDER COVER MODEL. I do not know what is going on as I hate to keep sending emails. It happens when it happens. The other two contracts, HEART OF ROCK and THE GOVERNESS AND THE BEAST were signed first of December. I have all the cover art, so that's cool. So because I have this glut of upcoming releases and no idea when they will be released, (except for The Wicked Bad) I haven't sent out any new manscripts. THE BLIND CUPID was a 'recommended read' in one of the latest newsletters from All Romance. Also made the historical best-seller list again, Cool. The Blind Cupid will be my last short story. Not my preferred story structure, but I gave it a go to see if I could do it. A few weeks ago I asked "where's the fun?" Well, I have backed away a bit from that Eeyore mood. Blame it on the never-ending winter and cabin fever. I have been doing a little writing, and I have several completed manuscripts that need work, so I have lots to keep me busy until Summer rolls around. And baseball starts April 1st! Go Red Sox! Great choice for Nick! I can absolutely see him in that role. Sons of Anarchy is a great series. And I totally forgot about Vikings! Must catch up.